Amateur Radio operators: DXtreme Station Log 12™. Automatic LoTW Upload — Users can set Station Log 12 so it uploads each log entry to LoTW automatically when added, capturing and saving QSO Record Status from the LoTW server as part of the process. Modified log entries can be uploaded as well. If desired, users can disable automatic uploading and can upload log entries to LoTW semiautomatically and manually in batches whenever they want to. LoTW Reporting — Users can perform searches and run reports filtered by LoTW QSO Record Status, which indicates whether log entries are On, or Not On, the LoTW server following upload or QSL-updating. Users can also perform searches and run reports filtered by LoTW QSL Record Status, which indicates the date of each LoTW QSL record processed by DXtreme’s LoTW QSL Update Utility. JT65A and JT9 Contact Pre-fill — Right-clicking the New button presents a shortcut menu that lets users pre-fill the Station Log window with log information from a JT65A or JT9 contact completed on WSJT-X or JT65-HF-HB9HQX Edition. Afreet Ham CAP Integration Expansion — Station Log 12 now integrates with optional Afreet Ham CAP throughout the program. Users activate Ham CAP by requesting short- or long-path propagation predictions on spotted and logged stations and entities. Quick Find — A box on the Station Log toolbar lets users type a call sign and press Enter to search quickly for a station in their log. If the call is in the log, a list of QSOs with it appears on a popup window. If desired, the list of log entries can be loaded into the Station Log window for viewing or editing, one log entry at a time. Improv Imaging™ — Lets users associate adhoc images with their log entries. This feature is like, but separate from, our popular QSL Imaging™ facility. Users can capture, scan, or paste any image and save it as a single-page .jpg, or single- or multi-page .tif. Improv images popular with users include signals on a spectrum analyzer or waterfall, QSOs conducted on Amateur Television and data applications, and rigs and antennas used during contacts. Other Imaging Enhancements — The QSL image previewer on the Station Log window is larger, as is the QSL Image Explorer, which also lets users call-up, in the Station Log window, the log entry associated with each QSL image, making the Explorer act like a Search window. Improv Imaging has its own, dedicated previewer and explorer. UX Improvements — Users can apply foreground and background colors and font attributes to grid headings and data rows throughout the program. DX Spot Checker™ — Receives DX spots from Telnet-based servers, and determines whether QSOs are needed for new or verified DXCC® entities, band-entities, mode-entities, or VUCC grids. DX Atlas Integration — Performs DX Atlas azimuth plots from the user’s location to that of a spotted or logged station. Also creates maps for a variety of reports. Band Master Integration — Afreet Band Master can be invoked with needed band and IOTA lists based on the user’s Station Log 12 database. Rig Control — Tunes/retrieves frequencies and modes from supported rigs through integration with Afreet Omni-Rig. QSL Processing — Creates QSL and address labels for physical QSLs, and supports the ARRL’s LoTW facility, including capturing LoTW QSL records as digital images. Audio Facility — Records and plays QSOs. Reports — Provides a wide range of performance and station reports to let users see how well they’re doing. Reports can be filtered and sorted. Includes DXCC® and WAS Analytics™ tools for analyzing and enhancing DXCC and WAS standing. DXtreme Station Log 12 runs in 32- and 64-bit versions of Microsoft® Windows® 10, Windows 8.1, Windows 8, Windows 7, Windows Vista®, and Windows XP. DXtreme Station Log 12 retails for $89.95 USD worldwide for Internet distribution. Reduced pricing is available for upgrading users, and CD shipment is available at a nominal surcharge. All prices include product support by Internet e-mail. 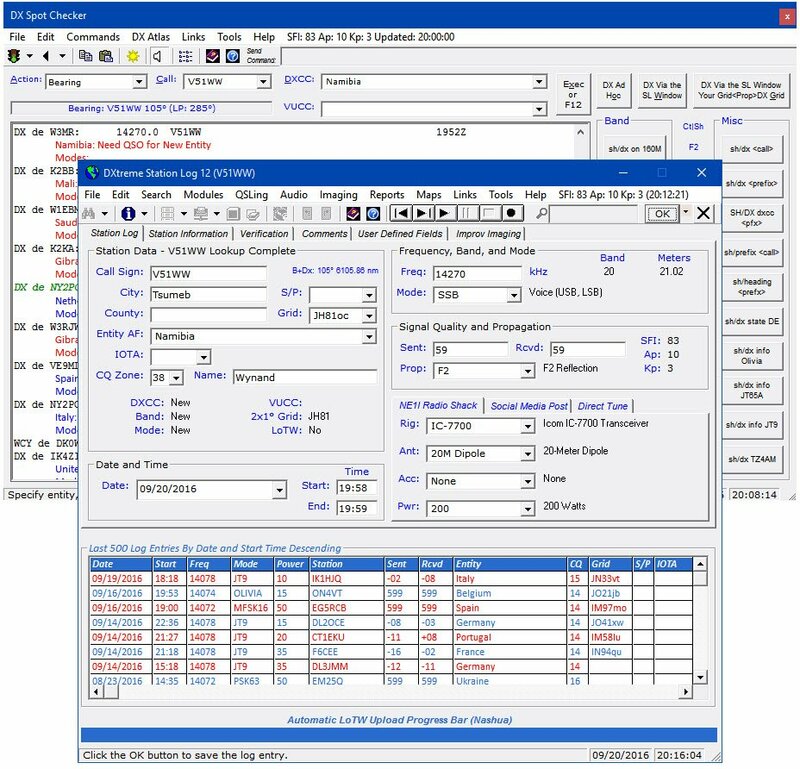 Based in Nashua, NH, DXtreme Software produces powerful and easy-to-use logging applications for all kinds of radio enthusiasts — from short-wave and medium-wave listeners and DXers to Amateur Radio operators. For more information about DXtreme Station Log 12, visit www.dxtreme.com or contact Bob Raymond, NE1I, at bobraymond@dxtreme.com. DXCC® is a registered trademark of the American Radio Relay League, Inc.
Microsoft®, Windows®, and Vista® are registered trademarks of Microsoft Corporation. Band Master, DX Atlas, Ham CAP, and Omni-Rig are owned by Afreet Software, Inc. A purchased software license for Band Master and DX Atlas are required to use them. JT65-HF HB9HQX Edition is owned by Beat Oehrli, HB9HQX. WSJT-X is owned by Joe Taylor, K1JT. This entry was posted in Ham Radio, New Products, News, Shortwave Radio and tagged Bob Raymond, DXtreme Station Log, DXtreme Station Log 12, Ham Radio, Shortwave Radio on November 6, 2016 by Thomas.